Rhodesian Ridgeback. Photography by Kayla Bertagnolli, as captured at the 2018 Westminster Kennel Club Dog Show. After a few high-energy puppy years, Rhodesian Ridgebacks can turn into pretty mellow pals. However, they are far from lazy. Ridgebacks have an incredible amount of energy and stamina. During long walks, runs or hikes, they will stay at your side and then some, making them the ideal jogging partner. They also appreciate the opportunity to break free and run through wooded areas, fields or canyons. Rhodesian Ridgebacks are gentle around the home. They play very well with children and have a reserved but gentlemanly way with strangers. However, they are super-protective, making them very effective watchdogs. Ridgebacks have powerful hunting instincts. Unless you’re in a controlled area or out in the countryside, always keep them on a leash. Also remember that these dogs were bred to hunt lions: They are fearless in almost any situation, especially around other dogs. Named after the “ridge” of hair along their backs, Rhodesian Ridgebacks were developed by South African Boer farmers to hunt large game. In the 16th century, European immigrants to South Africa brought Great Danes, Mastiffs, Greyhounds and other breeds. 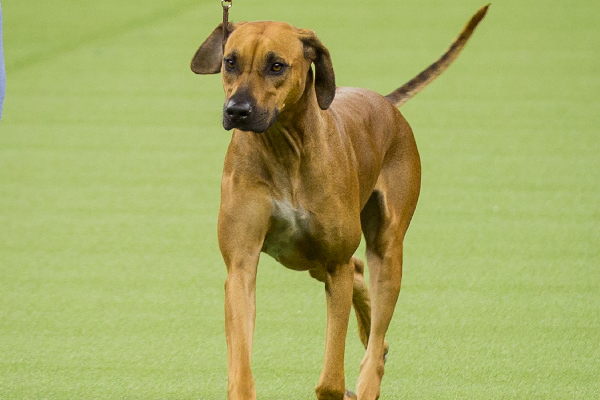 These were bred with native South African dogs to create the Ridgeback. 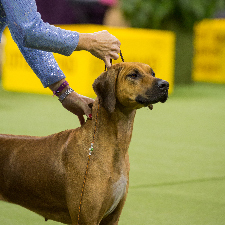 In 1922, a group of Rhodesian breeders set a standard for the Ridgeback. Registered by the AKC in the 1950s, they have just recently become popular in the U.S.